Proudly mistaken for No Mas! Cantina since 2011. Located in downtown Atlanta in the Historic Art District Castleberry Hill. 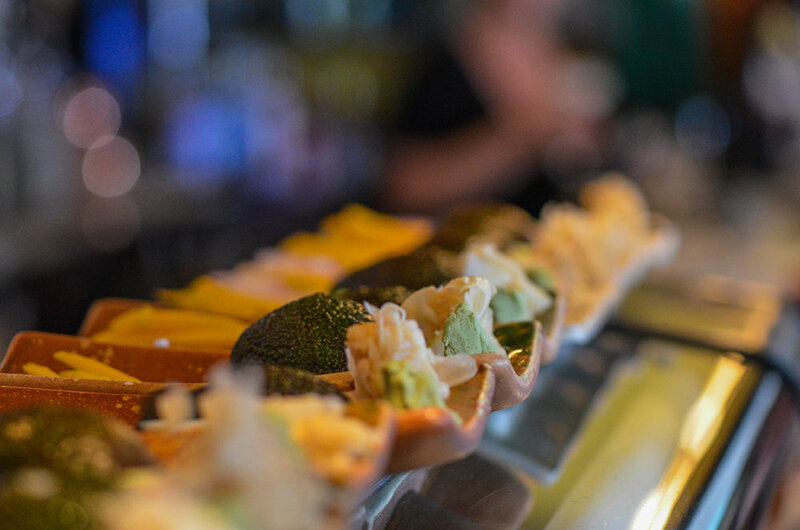 Offering up the best sushi in Downtown Atlanta as well as great items from our grill. Want sushi? We got that. In the mood for a burger and a beer? We got that too. You want another beer? I'll be right back. You want Mexican? No Mas! Cantina is actually next door. Black angus burger flash-marinated in a house Korean bbq sauce served with green leaf lettuce, red onions, & roma tomato on a locally-baked sesame seed bun. Served with battered, seasoned fries. Diced sushi-grade Ahi Tuna mixed with sesame, quail egg, panko & marinated with our house-made Korean bbq sauce served on a toasted bun with green leaf lettuce, red onion, roma tomato, avocado, & spicy aioli with a side of battered, seasoned fries. empura-fried soft shelled crab with onion, avocado, green leaf lettuce, spicy aioli, & a side of battered, seasoned fries. Green leaf lettuce, cucumber, mango, tomato, & red onion w/ a soy-ginger vinaigrette. Choose from: plain, chicken, salmon, steak or tuna. Choose from: pineapple & coconut, chicken, shrimp, steak, Japanese Fried Chicken Fried Rice or any combo. Add a fried soft-shelled crab for a small up charge. Flatiron steak flash-marinated in a Korean BBQ sauce. House fries & your choice of BR Starter Salad (House/Ika/Wakame) with an asian house sauce. Grilled flatiron steak served with your choice of nigiri (2 pc) & your choice of BR Starter Salad (House/Ika/Wakame). Bottle Rocket Roll - PEOPLE’S CHOICE FOR BEST ROLL!